BIG PIECES. During the design development, the stone contractor confirmed that it would be much faster to set this Birmingham, Michigan townhouse façade in large pieces, even though the specifications called for an unforgiving ¼” joint. Mike Keifer of Dixie Cut Stone & Marble Company, Inc., a stone fabricator from Bridgeport, Michigan, attributes the success of many ahead-of-schedule stone veneer projects they participate in to the practice of fully involving the entire project team in the design process. More than ever, as modern building technology multiplies the design issues, construction in stone is a team effort. More than ever, project schedules affect everybody’s bottom line. A successful design will benefit from comprehending the issues of all the players. Cost and permanence raise the stakes when the choice is made to build in stone. As an example, Mr. Keifer cites the Dolan Science Building at John Carroll University in Cleveland, a project which finished months ahead of schedule, much to the satisfaction of all participants. The Dolan Building was a new, College Gothic structure designed to blend in with the rest of a century old campus. Before the final design was produced, the architect called a meeting of all the trades, contractors and designers for the purpose of developing final design details. The designer expressed the result and the participants were required to produce a design that would achieve it. They were allowed any structural or joint design as long as it looked like the drawing. This was not always possible as several large, multistoried gothic windows soon illustrated. The structural engineer became concerned that wind load on this large expanse of glazing could not be supported unless the area was broken up with a center mullion. It was originally intended that the walls be constructed using traditional throughwall construction, but that idea was soon abandoned for a conventional four inch thick veneer anchored to a concrete block backer wall. The cross section of the veneered wall would not provide the window frame the solid support that the throughwall design had. Dixie Cut Stone offered to furnish a center mullion design to be mounted on a concrete block centerpost, but the masonry contractor suggested that support would be more efficiently furnished with steel framing. And so it was. All details were produced after two fully attended site meetings plus probably hundreds of emails and phone calls. This process was tedious, but it produced a reliable document, guiding the work with efficiency and with minimal change orders. IN CONCERT. 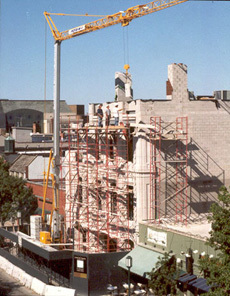 Stone for a new wing at Severance Hall, home of the Cleveland Symphony Orchestra, was delivered to the site in a sequence worked out between the stone mason and the stone fabricator and specified in the contract documents. Every detail was worked out by all participants in advance. Note the L-shaped returns on the corner pieces in the foreground. This is to match the appearance of existing full dimensional stone in a 2″ veneer. Project designs frequently require that extraordinary measures be taken by the stone fabricator to maintain the order and pace of the work. In the case of the expansion of Severance Hall in Cleveland, built in 1928, the work sequence itself had been worked out between the masonry contractor and the fabricator and was specified in the contract documents. Dixie produced full sized drawings of every piece, complete to the anchorage details, labeled with a three number code and keyed to an elevation of the building. The three numbers signified where the piece occurred in the building sequence, what type of building element it was (like elements being produced with like during production) and an individual serial number. Dixie labeled, packaged and shipped 60 trailerloads of stone, in sequence, as the mason contractor was ready, per the specifications. The process was so well controlled and documented that loss or confusion of the order was unlikely and, should it happen anyway, easily remedied. The Severance Hall project dramatically contrasts traditional throughwall systems with modern veneer and demonstrates how modern standards resolve and create design issues by demanding that the material achieve more with much less. The project consisted of several extensions to the original three story Georgian style concert hall. The original work was in load bearing Ohio sandstone and Indiana limestone ranging in thickness from about 9 inches to almost 36 inches in the overhanging cornice pieces. The new veneer was identical in appearance to the contiguous existing work but was a 2 inch thick veneer anchored to a load bearing concrete block wall. The extension design replicated every original detail, even specifying L-shaped corner pieces to simulate the appearance of the greater thickness of the original load bearing units. The reduction of stone volume offered by the veneer system saved money, but it offered further advantages over the traditional throughwall system as well. By introducing a well drained one-inch air space into the wall, it provided additional protection against water infiltration. By presenting a block wall to the interior, it facilitated the installation of finishes and other building systems. That said, anchoring the stone veneer to the load bearing masonry was a complicated matter involving considerable planning and fabrication of concrete and steel and requiring the participation of masons, ironworkers and engineers. As an example, consider the instability of the cornice detail in veneer, a unit with a width at the top of 18 inches bearing on a 2 inch base, requiring an engineered system of steel straps to restrain it from tipping outward. The stability of a stone veneer is entirely borrowed from the structure behind. Not every project presents the scale and complexity of the large commercial projects described above, but Mike Keifer asserts that smaller projects will also benefit from collaborative design which seeks to specify the most efficient assignment of project tasks possible. Planning is good, but Dixie also works with stone contractors who find the level of labeling and documentation described above to be wasteful and unhelpful. These contractors are quite capable of cutting stone or locating anchor slots where they are needed and they find it most efficient to be able to respond as necessary to field conditions. Restoration projects often require this level of flexibility. Sufficient discussions between the designer, fabricator and the installer can help to establish the most efficient level of fabrication and documentation. Joint layout is another area where efficiencies may be found. Designs employing arbitrary lengths are more wasteful than those using standard four foot quarry lengths, for instance. Breaking up large units can sometimes reduce costs and issues for both the fabricator and the installer. We have mentioned the contribution that the ironworker or CMU mason can make to the commercial project. In residential projects, however, the backer wall is often stick framed, not block or steel. Consulting with the framing contractor, therefore, may reveal similar efficiencies. For instance, Mike Keifer has found that the framing contractor is sometimes able to furnish solid blocking for anchors at less cost than the fabricator would be able to cut lengths to fit the intervals of the framing. The most efficient design is unlikely to emerge in time unless framer and fabricator consult at the design stage. He believes that the cost of material and complexity of stone veneer projects assures that design stage consultation with a broad range of participants is a rewarding investment. This entry was posted in Stonework and tagged Indiana Limestone, Michigan, Ohio. Bookmark the permalink.